We are providing Sagwan farming in Dwarka. Get sagwan clonal plants in hardoi. Sagwan or Teak is a tall and handsome deciduous tree. It grows well in warm climate and well-drained soil. It grows naturally in Myanmar and central and southern India and is propagated artificially in the Indo-Gangetic plains, and the foothills from Bengal to Haryana and Punjab on comparatively lesser scale, especially as an avenue tree. It grows happily in low height plains to the foothills up to 800 m.
Sagwan tree has an erect trunk, a cylindrical bole and an umbrella like beautiful crown. It tends to be fluted at the base. Its bark is thin, fibrous and light brown or grey in colour peeling off in long thin strips. Leaves are simple, opposite, large i.e. 30 to 50 cm x 25 cm, round, broad, pointed and thick in structure. New leaves appear in May-June. Teak flowers, which appear in July-August, are branched, 50 to 100 cm long whitish cymes. Individual florets are small and round with diameter of about 4 mm. The fruit appear in August-September and ripen between November and January. The seeds are small and take considerable time to germinate. Sagwan tree has annual growth rings. It grows quickly in the right conditions and puts on nearly one inch of growth in diameter in four to five years. It can grow up to a height of 45 m and a girth of about 4 to 5 m in nearly 100 years when its wood is considered fully mature and suitable for any use where along with strength, good looks of the finished product are the main requirement. Teak wood is considered to be one of the best timbers available anywhere. It weights nearly 20 kg to a cubic foot and its grains show beautiful patterns. It planes easily and takes varnish and polish very well. The going market rate as of now is nearly Rs. 1,200 per cubic foot. Teak has many other uses in addition to being an excellent timber. Its wood contains a kind of scented oil which renders any box or wardrobe made therefore repellent to white ants and other insects. The leaves yield a kind of dye which is used locally in colouring clothes, edibles, etc. These are also used as packing material and for making cheap leaf cups and plates and poor peoples’ umbrellas. The wood when hollowed exudes a kind of gum which is used in pan-masala. The juice of teak flowers is used for common cold. It whets appetite and relieves headache and acidity. Teak forests in their original habitat like Myanmar and Indian coasts regenerate on their own and abundantly. In comparatively less favourable areas it can be raised from seed in nurseries and transplanted when the seedling are one-year old. The new plants can also be propagated from cuttings in loamy soil rich in humus and having the right content of moisture with good drainage. Grown along roads and lanes, teak tree makes enchanting avenues. Some people grow a few teak trees, singularly or in a small clumps for beautification of their premises and or vacant plots. There too the species stand out boldly, thereby beautifying the overall landscape. 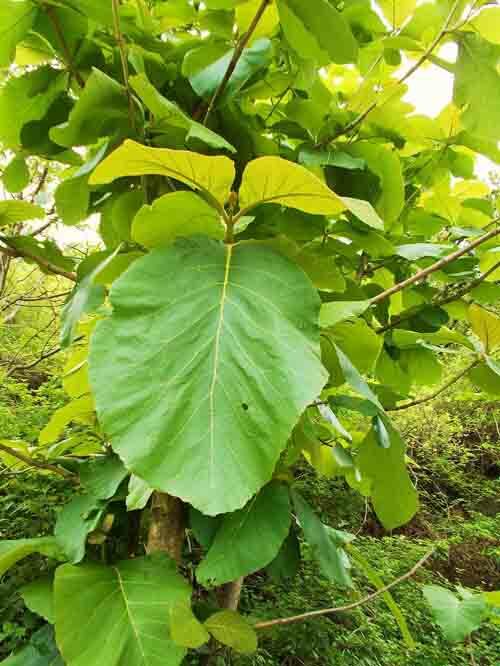 Sagwan tree is susceptible to damage by insects and bacteria. Considering Teak is so valuable a tree, the government forest departments prepare its seedlings in their nurseries for planting on the premises of government buildings and also to provide to people interested in its plantation.